Translator: Unknown. Introduction: Gregory A. Benford. Lincoln, Nebraska. University of Nebraska Press, 1998. x+292 pages, ?? ill.
A reputable publisher, Bison Books, distributed through the University of Nebraska Press, has attractively reprinted a Jules Verne book whole from the first British edition, on that basis calling it unabridged. Yet there is no acknowledgment of two fundamental facts: it is (of course) a translation from the French, and, most importantly, it is not derived from the actual text written by Jules Verne. Presumably Bison Books decided to reprint this little-known Verne novel in the same year that brought DEEP IMPACT and ARMAGEDDON into movie theaters. The Chase of the Golden Meteor contains a refreshing variation on this particular science fiction theme, one far different from the rather trite disaster formula the cinema has brought us. On the positive side, Bison’s reprint of the 1909 Grant Richards text published in London wisely retains 23 of the original 35 illustrations by George Roux from the French editions. Although never crediting the artist, the capable reproductions of the Roux illustrations make The Chase of the Golden Meteor one of the most visually pleasing Verne paperbacks to have appeared in years. The introduction by Gregory Benford is acceptable, stressing Verne as a writer of “hard” science fiction—using actual scientific fact in the story. Regarding turn-of-the-century translations as adequate renderings of Verne is surprising for a scholarly publisher; the wretched 1896 translation of The Floating Island (from Verne’s L’Ile à hélice, 1895), blithely reprinted by Kegan Paul in 1990, was exposed for its many faults by Arthur B. Evans in the pages of Science Fiction Studies (“Books in Review: New and Recycled Translations of Jules Verne,” 19 (1992), 261-262). Recognition of translation issues has been an essential element of Verne publishing since Walter James Miller first vividly exposed the drawbacks of earlier Verne translations in the preface to his 1965 edition of Twenty Thousand Leagues Under the Sea (Vingt Mille lieues sous les mers, 1869). Miller elaborated on these problems in the “Annotated Jules Verne” series, and other scholars have since followed his lead. 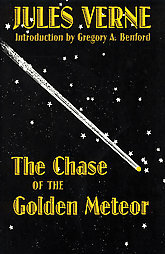 Even more significant is the fact that The Chase of the Golden Meteor was translated from one of the seven posthumously published Verne novels that were guided into print by the author’s son, Michel. For many years, the Verne family argued that Michel’s changes did not go beyond stylistic polishing, updating, or possible verbal instructions from father to son. However, once the evidence became public over twenty years ago, it was clear that Michel substantively altered all the works posthumously published under his father’s name, in both minor and major ways, even originating two of the books himself. The other posthumous volumes are Le Phare du bout du monde (The Lighthouse at the End of the World, 1905), Le Volcan d’or (The Golden Volcano, 1906), Le Pilote au[sic] Danube (The Danube Pilot, 1908, originally entitled Le Beau Danube Jaune [The Beautiful Yellow Danube] by Jules Verne), Les Naufragés du Jonathan (The Survivors of the Jonathan, 1910, expanded from Jules Verne’s En Magellanie [In the Magellanes]), Le Secret de Wilhelm Storitz (The Secret of Wilhelm Storitz, 1910), and the short story anthology Hier et demain (Yesterday and Tomorrow, 1910). L’Agence Thompson and Co. (The Agency Thompson and Co., 1907) was completely by Michel, but probably written in 1895 under his father’s supervision, while Michel wrote L’étonnante aventure de la mission Barsac (The Astonishing Adventure of the Barsac Mission, 1914) years after his father’s death from a fragment bequeathed to him entitled Voyage d’études (Study Trip). Verne first wrote La Chasse au météore in 1901, and reworked it shortly before his death, enhancing the international implications and financial speculations in the story. Verne had dealt with “outer space” twice before in his novels, in the duo of De la terre à la lune (From the Earth to the Moon, 1865) and Autour de la lune (Around the Moon, 1870), and in Hector Servadac (1877). While the lunar novels and Hector Servadac both have significant terrestrial portions, they also actually take the reader beyond the Earth’s gravitation—in a projectile around the moon, and on a comet traveling the solar system. Unlike these, but as in Sans dessus dessous (Topsy Turvy, 1889), La Chasse au météore remains strictly Earth-bound, although resembling its predecessors in the concern over how access to the realm beyond our planet will change society here at home—and seeing the United States as the nation of astronomical advances. These earlier books contain the seed of La Chasse au météore. The original ending of Hector Servadac had the comet Gallia impacting the Earth in the Caspian Sea, which swallowed it with minimal affect on the planet, despite widely anticipated destruction and global panic. However, Gallia proves to be 30% gold, turning it from a scarce into a plentiful mineral, and diminishing the value of gold reserves. Verne’s publisher, Pierre-Jules Hetzel, compelled a rewriting that eliminated this climax and changed a scientific story into one with Cyrano-style fantasy overtones, a dissonant ending that has long been criticized as incompatible with the rest of Hector Servadac. Verne waited over twenty years to expand the idea suppressed by the elder Hetzel (who had since died) into a full-length novel. Jules Verne’s original narrative, published by the Société Jules Verne in 1986, was derivative of his intended conclusion of Hector Servadac. In La Chasse au météore, two Virginia astronomers simultaneously discover a meteor heading toward Earth, and the subsequent rivalry, despite its amusing vanity, threatens the impending marriage of their respective son and daughter. When the meteor is discovered to be composed of gold, the disputed priority suddenly takes on serious international dimensions, and worldwide speculation ensues over the future value of the mineral. However, when the meteor lands on the shore of Greenland, it tumbles into the inaccessible depths of the ocean. In rewriting La Chasse au météore, Michel expanded his father’s novel from 17 chapters to 21 chapters, and made it more complex from a literary standpoint as well as enhancing the science fiction aspect. Michel adds a technological element to the novel, inserting a major new character, Zéphyrin Xirdal, an erratic scientist who has invented a device that attracts the comet to Earth, and brings it down from its orbit under his direction. Xirdal has selected Greenland for the landing, but becomes so disgusted by the global hysteria and his avaricious uncle’s attempt to manipulate the event for profit that he finally causes the meteor to fall into the sea. The financial markets return to the status quo, and Xirdal retreats to continue his own scientific work. Xirdal is a typical character in the Verne oeuvre, but his invention subtly shifts a major tenet of Verne’s writings. While his father’s forecasts were usually limited to what could be extrapolated from the known science of the day, Michel went considerably beyond these confining bounds of probability. This was true not only of Michel’s version of La Chasse au météore, but also of other science fiction stories he wrote and published under his father’s name, such as “Au XXIXe siècle: Journée d’un journaliste américain en 2889” (“In the 29th Century: The Diary of an American Journalist in 2889,” 1889), “Un Express de l’avenir” (“An Express of the Future,” 1893), “L’Eternel Adam” (“The Eternal Adam,” 1910), and The Astonishing Adventure of the Barsac Mission. Verne’s publisher was quite aware of the alterations Michel had made. In the November-December 1978 issue of Europe (“A propos des oeuvres posthumes de Jules Verne,” Nos. 565-566, pp. 73-88), a letter was published from the Hetzel archives (now in the collection of Piero Gondolo della Riva), outlining Michel’s changes to his father’s text. Additional shifts Michel made enhanced both the romantic subplot and the role of the housekeeper Mitz, with her distinctive malapropisms (that defy ready translation). While Bison’s reprint of The Chase of the Golden Meteor uses the 1909 translation of the Michel version, there is no recognition of the obvious question of the true authorship of the novel. Certainly a fresh translation of the novel Jules Verne had actually written, from the French text published by the Société Jules Verne, would be preferable. Perhaps the press’s budget only permitted a reprint of the 1909 translation, but certainly they ought to have admitted the problem. This cannot be laid to a basic ignorance of the facts that would be so typical of a commercial publisher. In fact, an email exchange between several Verne enthusiasts and Bison’s editor in mid-1998 over precisely these issues revealed the publisher’s awareness of the situation. Nonetheless, Bison seems to have closed their corporate eyes and hoped no one would notice. Certainly Bison Books has done a service in making a rare and important Verne work, out of print for over two decades, more readily available—but in far from optimal form. For more than thirty years, editions of Verne have deliberately explored textual issues surrounding their translation and the source French, in the translations of Willis T. Bradley, Anthony Bonner, Walter James Miller, Mendor T. Brunetti, Edward Baxter, Ron Miller, William Butcher, Emanuel Mickel, Evelyn Copeland, Frederick Paul Walter, and many others (including, I should acknowledge, the 1993 Oxford University Press edition of Adventures of the Rat Family in which I participated). For a publisher striving for academic standing to simply ignore these aspects is no longer acceptable, and in that respect Bison’s The Chase of the Golden Meteor is little more than a throwback to the 1909 version it reprints. -- Review by Brian Taves, Reviews of Books: Jules Verne, The Chase of the Golden Meteor. Extrapolation, 40 (Summer 1999) : 181-184. Reprinted in Pulpdom, No. 19, September 1999, pp. 18-19.